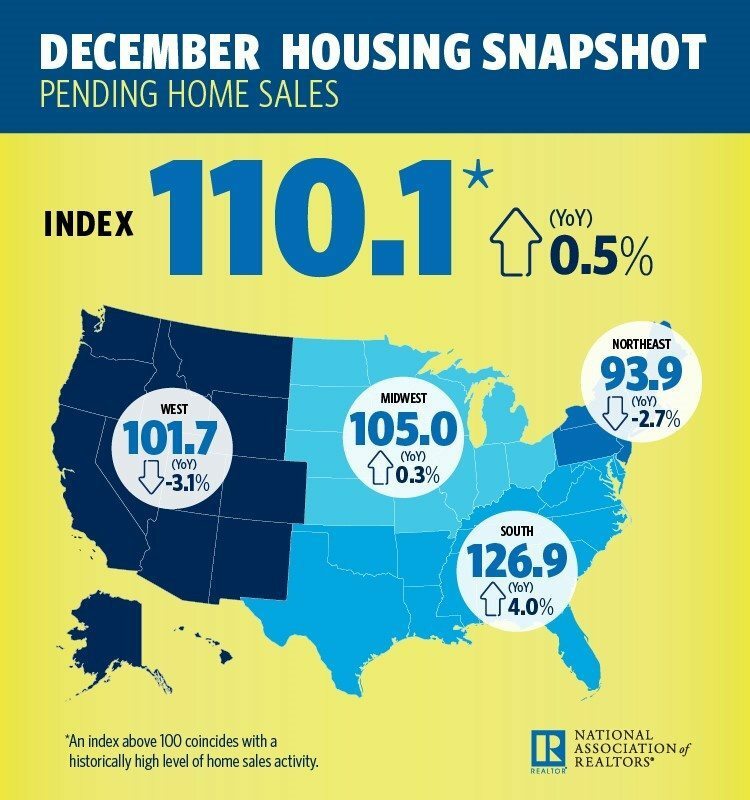 The National Association of Realtors (NAR) Pending Home Sales Index (PHSI), a forward-looking indicator that tracks home sales in which a contract is signed but the sale has not yet closed, increased 0.5 percent in the month of December to 110.1 from an upwardly revised 109.6 in November. NAR chief economist Lawrence Yun says the uptick in pending home sales is due to a healthy jobs market and an increase in wages, all of which encourage potential buyers to jump into homeownership. But, he says continued inventory shortages and rising home prices will dampen sales activity in the coming year. “Sadly, these positive indicators may not lead to a stronger sales pace. Buyers throughout the country continue to be hamstrung by record low supply levels that are pushing up prices — especially at the lower end of the market,” he added. December’s PHSI marks the highest recorded since March (111.3), and is 0.5 percent higher than a year ago. Inventory has continued to decline for the 31st consecutive month, and Yun expects existing home sales to increase 0.5 percent to 5.54 million in 2018. Yun also says the changes to the tax code could bolster demand in the short-term since households will see an increase in their monthly wages, but it could hamper the sales pace at the luxury end of the market since those homeowners won’t reap the same benefits from their high-dollar homes they did in previous years. 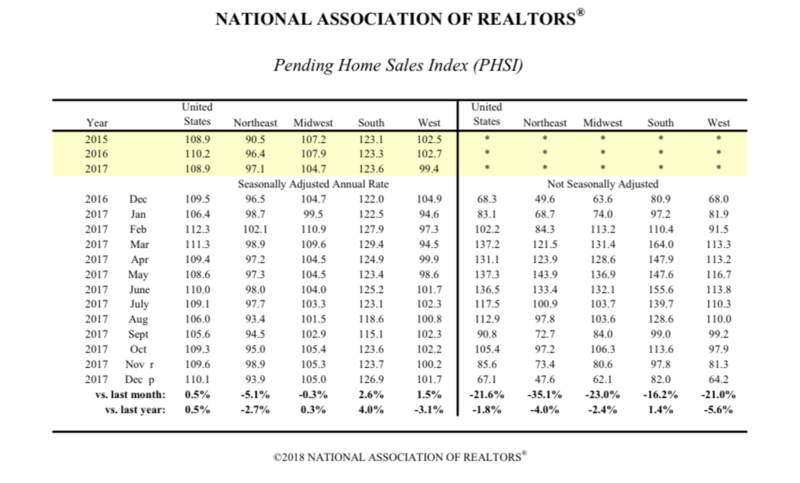 NAR uses a large national sample of signed residential property sale contracts to build its monthly pending home sales index. The sample size typically represents about 20 percent of transactions for existing-home sales. The index level was benchmarked to 100 in 2001, which was the first year to be examined. Existing-home sales in 2001 were in the 5 million to 5.5 million range, which is considered normal for the population in the U.S.